If you can sing, dance, act, play an instrument, prefrom magic or something else...show us what you've got! 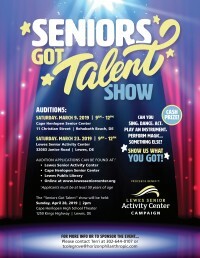 The Cape Henlopen Senior Center and the Lewes Senior Center will be hosting auditions for the "Seniors Got Talent" show to be held on Sunday, April 28, 2019 at 2 pm at the Cape Henlopen High School Theater at 1250 Kings Hwy, Lewes. Cash prices will be awarded and proceeds from the event will benefit the Lewes Senior Center. Applicants must be at least 50 years of age.